Scientists are still dancing around the afterlife… trying to make sense of it in Newtonian terms. Yet another study of near-death experiences (NDEs)—based on interviews with people who’ve died briefly and recovered—explores neurochemical explanations for the tunnels, doorways, glowing light, departed loved ones, and other lucid experiences… and notes that the crystalline afterlife memories are often much more profound and transformative than our normal, day-to-day memories. Read that Plos One report…. 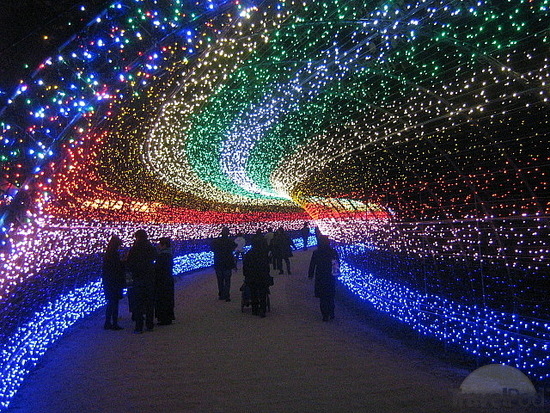 This is one one many pictures you can see by googling “rainbow tunnel,” suggesting that many artists are inspired by an afterlife knowledge deep within. This photo was taken by TravelPod member misocutlet of Kuwana, Japan. In a nutshell, the study published in Plos One concludes that about 5 percent of the general population and 10 percent of heart-attack victims report near-death experiences, yet no one really knows what they are… other than “flashbulb memories of really perceived hallucinations.” Adding complications to the study is the fact that healthy people sometimes have similar experiences during meditation and when taking certain serotonin-mimicking hallucinogenic drugs. Read a short history of hallucinogens…. Well, you and I know what NDEs really are. If you follow this blog you know that afterlife and the finer realms of spirit are the greater reality, while life on Earth is maya… illusion. That’s why, when our earthly blinders come down momentarily during an NDE or meditation, our glimpse of the other side is so lucid, so profound, and so life-changing. Once we experience the greater afterlife reality and process it through our physical senses, our noble motivations take the steering wheel, guided by the finer spirit within, while our savage inclinations—fueled by hormones, ego, and our carnal composition—move to the back seat. Read more about the spiritual basis of our afterlife glimpses…. This entry was posted in After we die, what then?, Heaven and Earth, Inner exploration, Other-worldly matters, Science and Technology, Spiritual realms and tagged NDE, near-death experiences, science and spirit. Bookmark the permalink.